The climber here is C/Sgt Geoff Broadman, who was attached from the army for his climbing expertise when CAW was in Genesis in the early ‘50’s. Land’s End is about as far away from anywhere as John O’Groats, and driving the A30 can feel like some form of purgatory at the end of long drive just to get to Exeter, but rest assured the rewards are exponentially better than the suffering. Stuck out on the end of the limb is West Penwith made up of rugged bullet hard Granite Cliffs, seperated by some of the most stunning beaches, harbours and coastline in the UK. Most people know of the climbing down here, but very few make the pilgrimage to these magnificent cliffs and even fewer have an idea of the history of some of the routes and how they helped train some of our military elite in the art of Assaulting Cliffs. Where in the process of training many of the climbing areas were first developed by the staff in the 1950s. Those soldiers were from the Royal Marines Commandos who are among the most respected fighting forces in the world. The veritable sharp end of the British military in many war and dare I say it ‘peace’ time engagements. Whilst I don’t want to glorify them in any way or speak of whether a war is right or wrong, as they are essentially tools to be used however our government deems fit. 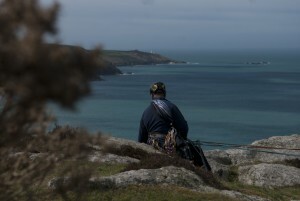 There is one small part of the Royal Marines that many people will have never heard of, its sole purpose when established was to develop and maintain the dark art of inserting troops at night onto a rocky shore, in challenging seas; then if necessary by climbing cliffs catch the enemy off guard and deliver an effective blow to their least defended side. It has had many names but historically for climbers it is best remembered as the Cliff Assault Wing. I first came across the then Mountain Leader Cadre, at their base in Cornwall when I was only 18, a pimple face A-level student who had managed to get a place on a rock climbing course run by the same instructors who ran the courses for the Royal Marines. At the time it was one of my ‘career options’ as I was already a keen climber, but desperately wanted to find a way to do it as a living. I failed the Marines physical just over a year later and instead went onto realise my other dream of becoming a civilian instructor. That week in Cornwall though had a considerable bearing on the direction of my life. Historically the unit started to take shape during the Second World War in Braemar the gateway to the southern Cairngorm’s, providing as it did a near perfect replication of the then occupied Norway. It was run by well-known historic climbing figures, like John Hunt and Frank Smythe and was more focused on Mountain and Arctic Warfare. However as the war continued the emphasis went from Norway to the English Channel and how we could mount what would eventually be the successful D-Day Landings. Whilst trained in the art and indeed 46 Commando was held in readiness for a cliff assault during the D-Day landings they were never deployed on this task on the day. To meet the needs of preparing to invade the Normandy coast the unit was moved to St Ives in Cornwall and was responsible for training many men to become Picasso like in their nights raids on coastal targets. After the war they continued to maintain cliff assault as a training specialism, an off-shot of which is still around today. It became the Cliff Assault Troop in 1962 and the Recce Leader Troop in 1965 and eventually the Mountain and Arctic Warfare Cadre in 1970, where the specialism now requires candidates to pass a Marines’ Mountain Leader selection course. It is however their effect on British sea cliff climbing that I want to focus on here and the important legacy the wing also had on how climbing is taught. For Marines would turn up on the first day of the course as veritable green horns, with very little in the way of ‘mountaineering’ experience and by the end of a 4 weeks instruction be rock climbers and by 6 weeks be part of the elite Cliff Assault Wing. One of the climbing commandos most famous members was Mike Banks, who wrote the book Commando Climber, which is available from specialist books shops for a reasonable price. Whilst his impact on the Cornish Climbing scene was minor compare to some of the staff his book offers an insight into this secretive group. He saw there training as being highly organise being both a quick and an effective at turning a marine into a climber. As a modern day climbing coach some of the generic teaching skills we call pedagogy were formed after the war when the need to train large number of troop quickly became important enough to spur research into teaching skills. It was more than these generic teaching skills though that are important to climbing as the Cliff Assault Wing was essentially one of the earliest experiments in instructing people to climb. 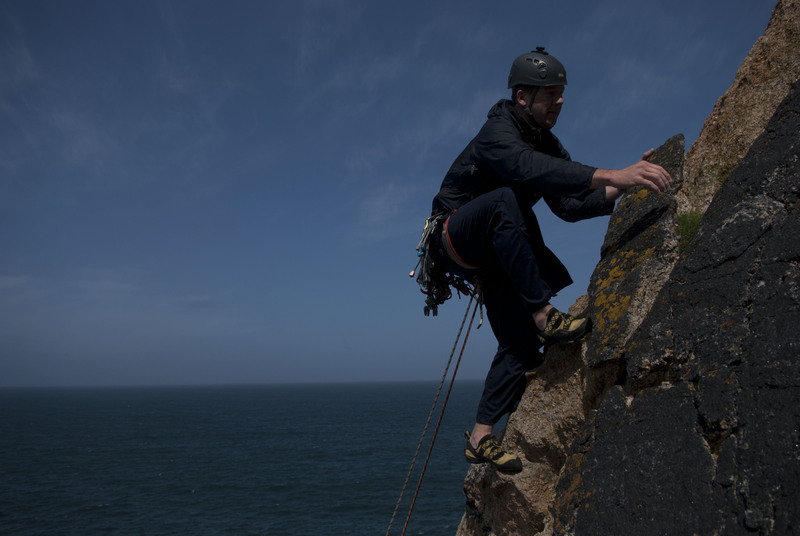 As such those techniques formed back then are quite possibly the antecedents of modern day climbing coaching and instrcution, all taking place on routes that have now become classics climbs of West Penwith. Although one story recounted by Mike Banks, and one assumes it was just a story told to scare recruits, was of a student who was lacking the moral fibre to get up a climb and the story goes the instructor tied a rope rope his neck and lit a fire below him in order to coax him up the climb. I would like to think that this practice has long since finished. A classic view from the belay atop a west pen with climb. That effect of the Cliff Assault Wing on teaching climbing really shouldn’t be underestimated, as Alan Blackshaw served as a full time instructor there for two years, before continuing as a reservist for several more. Ten years after he left his full time position he wrote in his spare time one of the early climbing handbooks called Mountaineering: From Hillwalking to Alpine Climbing published in 1966. Alan was an impressive Alumni for the Cliff Assault Wing who went onto become the president of the BMC, UIAA and the Alpine Club, as well as have a very success career in the civil service yet his first job after leaving Oxford, one presumes as part of the then mandatory national service was as an instructor with the Cliff Assault Wing. Pyatt criticised the marines tactics stating, “They had their own methods – grappling irons a la Whymper, etc., and used their own names for climbs.” However their early aim wasn’t ethically pure ascents afterall, but to get to the top by hook or by crook. It was only in later generations that the team of students and more notably staff started to develop some of the areas more famous climbs. Even then the Climber’s Club disagreed with some of the Marines naming them after themselves, Genge’s Groove at Sennen is just one such example. However the Marines tended not to use a guidebook so I doubt whether they noted down ascents. Instead the routes used on the courses were handed down from one generation of instructors to the next. This has probably led to the loss of much of the rich history they undoubtedly added to the area. One such crag is Halldrine Cove, a fairly small and insignificant crag described by Mike Banks as a favourite place to start the climbing course and also returned to at many points throughout the course. Meaning you’d have expected them to have climbed all the easy and obvious lines. Yet there have been routes claimed here at HVDiff as recently as 2010, one presumes because the Marines ascents have long been forgotten. In that same article on the climbing of West Penwith, Pyatt recounts a story told by the famous climber Frank Smythe who ran the Wing for a short period. 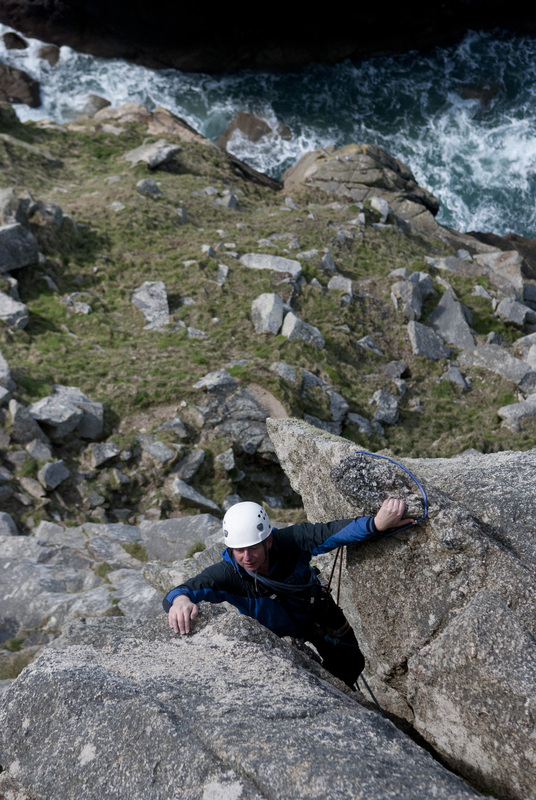 The story took place on top of Sennen, one of the Marines favourite crags for training. During one exercise a boat capsized at the base of the cliff, a Corporal Meddings rushing to help rescue those now adrift at the base slipped on the grassy slopes above the cliff. Exiting the top of the cliff, he managed to jump for a narrow rift at the base some 100ft below. He survived with a dislocated shoulder and also managed to rescue one of the drowning men. Other Marines names to look out for on first ascent are Joe Barry, Eric Stone, J. ‘Zeke’ Deacon, Rawdon Goodier, Mac McDermott, Simpson and Viv Steveson. Although sometimes you will just see Cliff Assault Wing or Commando Party, some of the best route they put up in each of the four major areas are below. As you’ll see below the effect they had on climbing in the area was quite outstanding for the period. and often overlooked. Throughout the area the sea makes what can only be described as a muffled boom followed by the sound of the sudden intake of breathe made by any trademans when you ask them for a quote. Today it is a slow and steady rhythm, a soft calming voice set against the coarse hard tones of the granite. It has been years since I was last here and I am solo like Joe Barry was on the first ascent. This is not the familiar mountain rock of home, the friction is different, the grain is off kilter and the holds despite feeling ample are like I am being asked to speak in a foreign tongue, so my heart races. Only when I am at the ledge do I settle down before summoning up the courage to make the unsettling move left round the fang and onto the exposed slab. An alpine ridge cuts its way steeply out of the growling Atlantic. This soaring arête would not be out of place in the Chamonix Aguilles. Yet here it is juxtaposed against aqua marine sea and an alpine blue sky. It is without a dought one of the best routes of its grade anywhere in the UK. 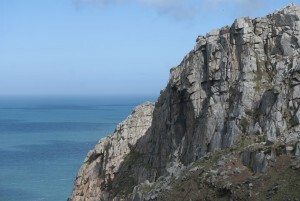 Where you gain the ridge seems rather arbitrary, as the meat of the route is higher up, yet you have to scramble down near the sea to get to it and is something of an adventure in its own right, and many might want to rig an abseil from the ‘col’. The route finding is easy if you have a mountaineering background, stay more or less on the arête, veering to the left and right as the rock dictates and follow it to the ‘col’ over which you descended before continuing on to the top. Along the way you pass a memorable foot traverse left, a slab and some almost obligatory Au Cheval sections. It is just one of the routes by routes used by the cliff assault wing, and there are many more easy classic that the team used here like Doorpost, Black Slab and Ledge Climb. The Climber Club purchase of the Count House, meant that much of the development was done by the members. Although there are also a few routes there developed by the Marines the most notably being Doorway and Zig-Zag. Although remember if you want easy single pitch climbs then they also used the neighbour Halldrine Cove, that is visible just east of the crag from its summit. Unlike most of the other crags mentioned here, Chair ladder essentially drops straight into the sea, and whilst there aren some ledges at the bottom the seas here can render them anywhere from unappealing to down right life threatening. Although saying that this winter there were waves breaking over the top of Sennen. “Perhaps it was the nearness of the sea, perhaps the wheeling of the plaintive gulls, or perhaps just my mood at that moment, but I seemed to sense a wildness, an air of aloofness about the place. I had a vague impression of intruding; an impression which returned to me each time I revisited these wonderful cliff” – Mike Banks reflecting on his first trip to Chair Ladder. Some of the best route by the Commandos include Seal Slab, Pegasus, Red Wall, Excelsior, Pendulum Chimney, Detergent Wall, South Face Direct and Flannel Avenue. There is a certain ‘end of the world’ feel to Land’s End, it is after all the end of the UK and the first port of call for any Atlantic swell going. However the top of the cliffs looks and feels like the tourist attraction that it is. A honey pot for day trippers of all ages and as a result does not has the same isolated feeling of Chair Ladder and Bosigran. 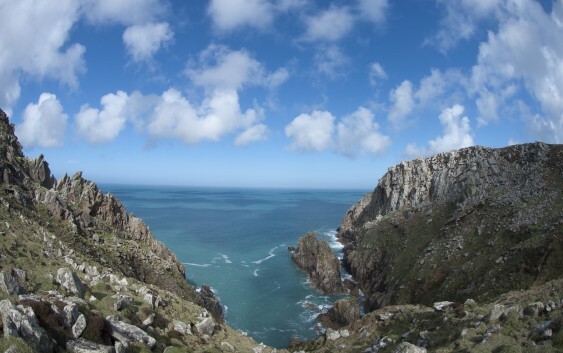 Nears its most westerly point is a another of the Commando’s Classic routes the Land’s End Long Climb. Essentially nine short steps up a ridge feature all of which are easily avoidable, making it a poor companion to the ridge at Bosigran but popular none the less. It one advantage is it virtually ends in the Hotel Bar and you can certainly send a runner for an ice cream whilst you belay! Other routes the Commandos were involved with in the area, some of which used aid on the first ascent include The Cormorant’s Bill, Johnstone’s Route, World End, Zawn Face Route and Longships Wall. If you are a member of a climbing club, then I would suggest using the reciprocal rights and book a few nights in the Count House as it sits atop Bosigran. If you want to B&B then there are hundreds in the surrounding area. For camping I recommend the Trean Campsite which is close to Chair Ladder and Porthcurrno, it is also easy walking distance to the Logan Rock Inn. There are numerous cafes, restaurants and pubs that do food. As well as a chippy in nearly every village. I highly recommend Heather’s Café in Pendeen between Bosigran and St Just, especially for the coffee and cake lovers. The Logan Rock Inn also has a great menu and is rather unique in that they ask that you don’t use mobile phones, the result of which is that people actually talk to each other. Cornwall is gear up for tourism, so there are hundred of things to do in the wet, unfortunately a climbing wall isn’t one of them. Although I can recommend hiring a surf board at Sennen Cove and giving that a go if you haven’t, although it is not a very restful activity. Another option for restdays would be to enjoy a walk along the amazing South West coastal path. Wow, sounds like you led quite a life. I wish I could help you find some images, but all I did was write this article and use modern images. Maybe someone will read this with access to the images and help you out. I too would be really interested to add some historic images to this article. I’ve a few photos from, I think, the early fifties. My grandfather climbed there as an army commando in the forties, for example, he did mention getting a first ascent on Banana Flake. 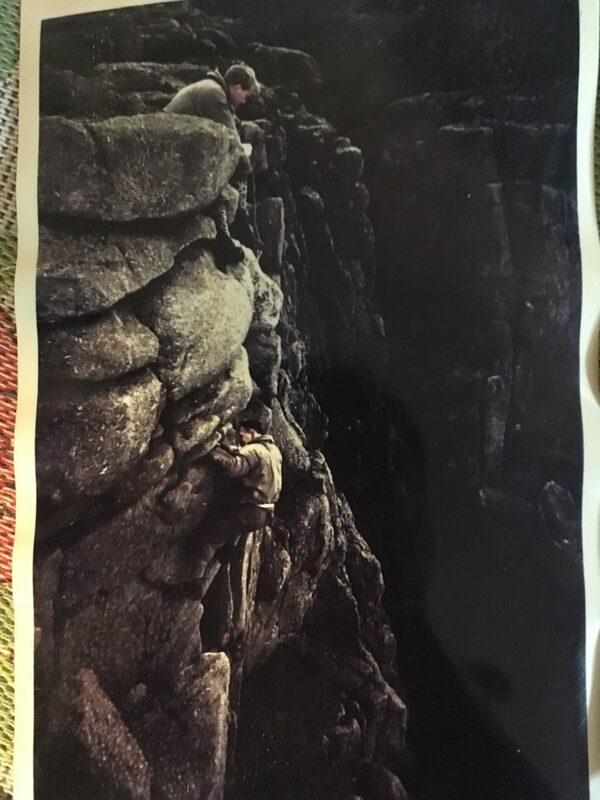 He climbed there again with Cliff Assault Wing in the fifties which is when I guess these photos were taken. I’ll send them over if I can figure out how to!